Objective: Tyrosine kinase inhibitors (TKIs) which efficiently inhibit BCR-ABL are highly effective for clinical treatment of chronic myeloid leukemia (CML), but development of resistance to TKIs is a big challenge to treatment. Sunitinib is a multitargeted TKI targeting vascular endothelial growth factor receptor and is defined a safe and effective candidate target, but its effect on other signaling pathways is unknown. To investigate the cytotoxic and apoptotic effect of sunitinib in CML cell model K-562 on JAK-STAT signaling pathway components, suppressor genes and oncogenes, hematopoiesis-related genes, cell cycle and VEGF pathway components, and mRNA level expression changes was aimed. Materials and Methods: Sunitinib's effective dose cytotoxic IC50 was determined by trypan blue and WST-1 cell proliferation assay tests. Expression levels of target genes were determined by quantitative reverse transcriptase polymerase chain reaction simultaneously after sunitinib application. Protein expression analysis was determined by “WesternBreeze Chromogenic Kit-Anti-Rabbit” based on the principles of the application kit by Western blot analysis. Results: Assessing the cytotoxicity of K-562 cells following sunitinib treatment revealed that sunitinib decreased cell proliferation in a time- and dose-dependent manner. According to the sunitinib inhibition curve, IC50 dose was calculated as 3.5 μM at 48th h for K-562 cells and apoptosis assays pointed that sunitinib induces apoptotic cell death of leukemic cells at moderate levels. Conclusion: Our study supports that sunitinib might be used as a novel therapeutic target to trigger apoptosis in CML cells which in turn might accelerate therapeutic response in regard to inhibiting oncogenes and enhancing tumor suppressors in cooperation with cell cycle regulatory genes. Chronic myeloid leukemia (CML) is a malignant myeloproliferative clonal disorder of hematopoietic stem cells, resulting from a translocation between chromosomes 9 and 22 t(9;22)(q34;q11) or its variants t(v9;22). This reciprocal translocation generates the shortened 22q known as the Philadelphia chromosome and the new fusion oncogene is called as BCR-ABL. This oncogene encodes a chimeric 210 kDa BCR-ABL protein that incorporates an activated ABL tyrosine kinase domain. The recognition of the BCR-ABL oncogene and the corresponding protein gives rise to synthesis of small-molecule drugs, designed to interfere with BCR-ABL tyrosine kinase activation. Following the introduction of targeted treatment with tyrosine kinase inhibitors (TKIs), treatment strategies and outcomes had changed dramatically. Imatinib is the first used and generally well-tolerated TKI that targets the tyrosine kinase activity of BCR-ABL. Vascular endothelial growth factor (VEGF) is one of the most potent and specific regulators of angiogenesis, which principally targets endothelial cells and regulates several of their functions, including mitogenesis, permeability, and migration, and also promotes leukemia cell proliferation and survival. Recent studies indicated that plasma VEGF levels were significantly higher in CML patients as compared to healthy subjects and there were significant associations between plasma VEGF levels and marked splenomegaly, and VEGF was found significantly increased during blast crisis phase than during chronic phase. Compared to controls, the proliferation of the K562 cells was suppressed when VEGF expression was inhibited. VEGF plays an important role in the initiation and development of CML, and monitoring serum VEGF assists guiding the treatment and predicting the prognosis of CML. Sunitinib is an oral small molecular multitargeted TKI that inhibits phosphorylation of split kinase domain family members of antiangiogenic receptor tyrosine kinases (RTKs), such as type 1 and type 2 VEGF receptors (VEGFRs), platelet-derived growth factor receptors alpha and beta (PDGFR-alpha and PDGFR-beta), stem cell factor receptor c-KIT, colony-stimulating factor 1, fms-related tyrosine kinase 3 (FLT3), and RET kinase. Sunitinib demonstrated an antitumor activity in the preclinical studies by resulting in tumor growth inhibition and tumor regression in models of colon cancer, nonsmall cell lung cancer, melanoma, renal cell carcinoma, and squamous cell carcinoma. Sunitinib was also approved for the first-line treatment of metastatic renal cell carcinoma (mRCC) and imatinib-resistant metastatic gastrointestinal stromal tumors (GISTs) due to definitive clinical efficacy. Referring to therapeutic effect of sunitinib on imatinib-resistant GIST and advanced renal cell carcinoma with modest tolerability, we aimed to investigate sunitinib induced apoptotic cell death of CML cells, and to determine the molecular mechanism of sunitinib treatment in CML cell model K-562 cell line, and to clarify the possible genes' involved in either proliferative or inhibitory effects. 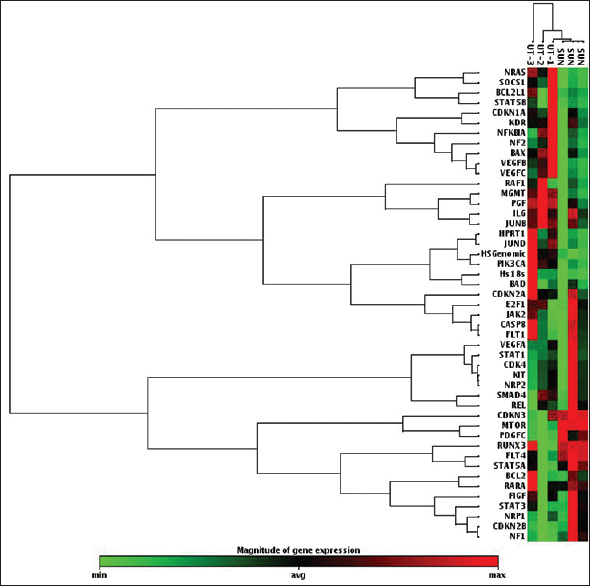 In this regard, we detected transcriptional differences including VEGF signaling and apoptosis-related genes, tumor suppressors, oncogenes, some JAK/STAT pathway members, and finally cell cycle genes regarding gene expression profiles. Human CML cell model “K-562” was purchased from European Collection of Cell Cultures company. K-562 was maintained in RPMI 1640 medium containing 10% heat inactivated fetal bovine serum, 100 units of penicillin-streptomycin/ml, and 1% L-glutamine at 37°C in humidified air containing 5% CO2. Cells exhibiting 95% viability and 80% confluency were used in experiments. Sunitinib malate (product no. : 341031-54-7) was purchased from Sigma-Aldrich (St. Louis, MO, USA) and dissolved in dimethylsulfoxide (DMSO) as stock solution, and serial dilutions were prepared in serum-free medium; hence, the final concentration of DMSO did not exceed 0.1% of the total incubation volume. Cell viability and proliferation patterns of sunitinib-treated cells were determined by WST-1 assay (Roche Applied Science, Mannheim, Germany) by comparing with untreated control cells. In brief, cells were seeded into 96-well plates at a density of 30 × 103 cells in 0.1 ml medium/well. Cells were treated with 0.1 ml increasing concentrations of sunitinib for duration of 72 h. By following the user manual, 20 μl WST-1 reagent was added into every well of the plate and each sample' s absorbance was measured spectrophotometrically with an ELISA reader (Thermo Fisher Scientific, Vantaa, Finland). All experiments were performed in triplicate with six repeats. The obtained results were analyzed with the GraphPad Prism 5.0 (GraphPad Software, Inc., San Diego, CA) software; cell proliferation curve was generated and IC50 value of sunitinib was calculated for K-562 cells. The calculated IC50 value was used throughout the study in apoptosis and quantitative reverse transcriptase polymerase chain reaction (qRT-PCR) assays. Apoptosis rates of sunitinib-treated and -untreated cells were assessed by two methods. We measured caspase-3 activity via caspase-3 colorimetric assay kit (BioVision Research Products, Mountain View, CA, USA) and also used a photometric enzyme immunoassay “Cell Death Detection ELISA Kit” (Roche Applied Science, Mannheim, Germany) that allowed detection of mono- and oligo-nucleosomes and thus measured apoptotic cell death. Both assays were triplicated and based on spectrophotometric measurement at 405 nm with an ELISA reader (Thermo Fisher Scientific, Vantaa, Finland); hence, apoptosis rates between IC50 dose sunitinib-treated and -untreated cells were assessed by comparing the absorbance of each sample. In qRT-PCR assay, we analyzed selected 48 genes' expression profiles before and after sunitinib treatment as custom design. These genes were composed of VEGF signaling and apoptosis-related genes, tumor suppressors, oncogenes, JAK/STAT pathway members, and finally cell cycle genes with internal control housekeeping genes, regarding gene expression profiles. For these mRNA expression analyses studies, 1 × 106 cells were incubated with IC50 dose of sunitinib and a group of untreated cells were served as control group with the same cell number for duration of 48 h. At the end of incubation time, both sunitinib-treated and -untreated cells were collected and total RNA extraction was performed using “MagNA Pure LC RNA Isolation Kit” (Roche Applied Science, Mannheim, Germany)according to the manufacturer's protocol. The amount and quality of isolated RNAs were measured by NanoDrop spectrophotometer and 600 ng RNA was reverse transcribed via “All-in-One™ First-Strand cDNA Synthesis kit” (GeneCopoeia, Inc., Rockville, MD, USA)following the instructions. Therefore, determined genes' expression profiles were carried out by “StellARrays™ qPCR Array” (Bar Harbor BioTechnology, Inc., Trenton, NJ, USA)in 96-well plate array format and prepared MasterMix with 2X SYBR® Green Master Mix-"hot start” (Bar Harbor BioTechnology, Inc., Trenton, NJ, USA) following the instructions with recommended cycling parameters by real-time PCR instrument, ABI 7500 Fast (Applied Biosystems®) in triplicate. The expression levels of target genes were determined by ΔΔCt method following log 2 transformation. Cell proliferation experiment results in order to determine the IC50 value of sunitinib were calculated with the GraphPad Prism software v5.01. Relative mRNA expression levels gained at the end of qRT-PCR analyses and apoptosis assay results were evaluated with Student's t-test referring to significant of P < 0.05 in SPSS 15.0 software (Inc., Chicago). The cytotoxicity of K-562 cells following sunitinib treatment was assessed by WST-1 cell proliferation assay and the obtained data showed that sunitinib decreased cell proliferation in a time- and dose-dependent manner. According to the sunitinib inhibition curve, IC50 dose was calculated as 3.5 μM for 48th μM for K-562 cells [Figure 1]. In general, apoptosis assays pointed out that sunitinib had moderate impact on leukemic cells compared to untreated control cells. 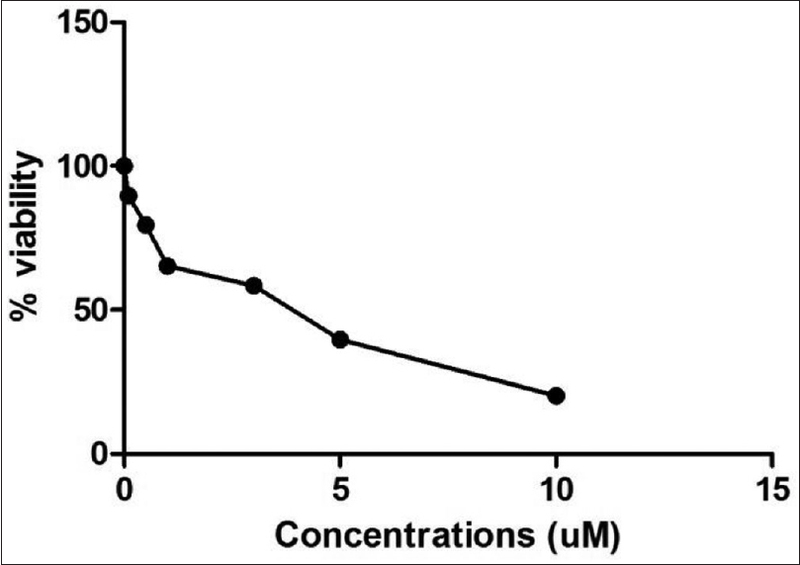 The absorbance levels obtained from caspase-3 activity assay showed that its activity was increased 21.37% in sunitinib-treated K-562 cells that stand for 1.271-fold upregulation in apoptotic activity [P = 0.067, [Figure 2]a. As for cell death analyses assay results, the absorbance levels indicated that 20.06% apoptosis indication was detected in sunitinib-treated cells as compared to untreated control group with 1.251-fold increase in apoptosis rate [P = 0.062, [Figure 2]b. These results indicate that sunitinib has a moderate apoptotic impact on leukemia cells. As for the results, initially, we detected that the genes that regulate VEGF signaling such as VEGFA, VEGFB, and VEGFC were downregulated as −1.01, −1.29, and −1.31 folds, respectively, with only significant in VEGFB suppression with P= 0.04 following sunitinib treatment compared to untreated control cells. Besides these, while FLT4 gene was 1.77-fold upregulated (P = 0.01), FLT1 was −1.04, KDR was −1.30, and PGF was −1.60 folds downregulated (P = 0.02). In general, we observed that except FLT4, VEGF signaling was damaged due to sunitinib treatment as expected. Secondarily, we analyzed some JAK/STAT pathway members that were famous for having leukemogenesis-inducing effects in CML. Among them, while a non- RKT JAK2 was 1.08-fold upregulated, the cytokine IL-6 expression was −1.23-fold downregulated, P> 0.05 for both. We also detected the members of the signal transducers and activators of transcription (STAT) family of transcription factors such as STAT1, STAT3, STAT5A, and STAT5B. Among them, while proapoptotic gene STAT1 was 1.12-fold upregulated, its paralog gene STAT5B was −1.44-fold downregulated, P> 0.05 for both. However, a strong oncogene STAT3 was 1.18-fold and hemato-oncologically active STAT5A was 2.05-fold upregulated compared to control cells. Besides these, suppressor of cytokine signaling 1 (SOCS1) expression was −2.07-fold downregulated, P= 0.06. In general, sunitinib treatment failed to inhibit JAK/STAT signaling very effectively due to expressional upregulations in JAK2, STAT3, and STAT5A and inhibition in SOCS1 expression; however, STAT1 upregulation and STAT5B downregulation were the promising results. Next, we detected cell cycle regulatory genes and observed downregulated expressions of cyclin-dependent kinase inhibitors CDKN1A and CDKN2A with −1.4-fold decreases for both, P> 0.05. Furthermore, while CDK4 expression which showed oncogenic activity was upregulated, CDKN3 that was detected as overexpressed in several kinds of cancers was overexpressed by 2.06-fold, for both P> 0.05. Only CDKN2B we evaluated from cell cycle-related genes was upregulated as 1.86 fold that worked as a tumor suppressor. These results indicated an expressional dysregulation in cell cycle regulatory genes following sunitinib treatment for CML cells. Among tumor suppressor genes that we have evaluated, while neurofibromin 1 (NF1) expression was significantly upregulated by 2.65-fold (P = 005); Runt-related transcription factor-RUNX3 and SMAD4 expression were also overexpressed by 1.58-fold and 1.03-fold, respectively (P > 0.05 for both), following sunitinib treatment. Besides, we evaluated some oncogenes' differing transcriptional patterns following sunitinib treatment and detected some encouraging results. 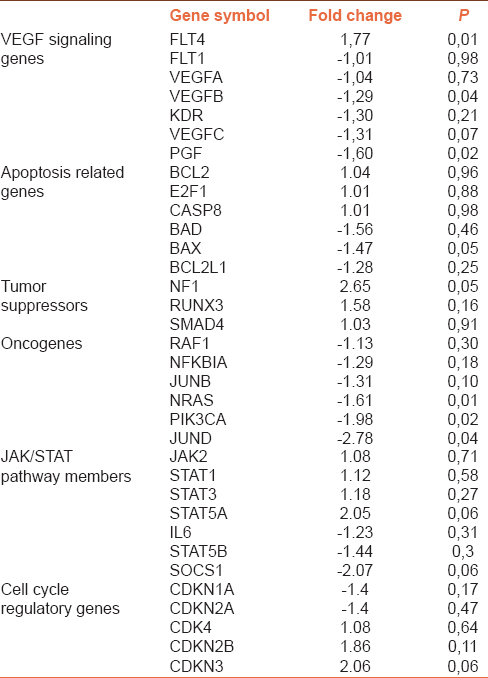 Especially NRAS, PIK3CA, and JUND oncogenes exhibited significant inhibitions in their mRNA expressions with −1.61, −1.98, and −2.75 folds' inhibitions, respectively. In addition, some other oncogenes showed moderate levels of downregulation as −1.13-fold in RAF1, −1.29-fold in NFKBIA, and −1.31-fold in JUNB, with P> 0.05 all. Finally, we have analyzed some apoptosis-related genes' expression profiles and tried to figure out the mechanism why sunitinib triggered apoptosis at low levels in K-562 cells due to caspase-3 and cell death detection assays at the early stages of the study. As for mRNA results, while the antiapoptotic gene BCL2 expression was 1.04-fold upregulated, the proapoptotic or apoptosis inducer genes BAD and BAX expressions were downregulated by −1.56-fold and −1.47-fold, respectively (P > 0.05 for both), which could be the reason why apoptosis induction was at very low levels in our apoptosis assays. As for pleasing results, while the proapoptotic gene caspase-8 was 1.01-fold and apoptosis inducer gene E2F1 was 1.01-fold upregulated, the antiapoptotic gene BCL2 L1 expression was decreased by −1.28 fold, P> 0.05 for both. In general, we concluded that low levels of apoptosis induction following sunitinib treatment could be related with initially caspase-3 and caspase-8 which were pivotal junctions in apoptosis pathway and secondarily E2F1 and BCL2 L1 transcriptional regulations. The hierarchical cluster diagram of differential gene expression profiles can be evaluated in [Figure 3] and [Table 1]. In our study, we also aimed to determine the cell proliferatory, apoptotic, and gene expressional regulatory effects of sunitinib on CML cell model K-562 cells. Initially, we detected that IC50 value of sunitinib was 3.5 μM for K-562 cells for 48 h of treatment and sunitinib inhibited cell proliferation in a time- and dose-dependent manner; thus, Teng et al. have calculated IC50 dose of sunitinib as 4.5 μM for AML cell model HL-60 for the same duration of treatment, pointing similar concentrations for leukemia cells. Similarly, Nishioka et al. have reported that while sunitinib (10 nM, 48 h) alone inhibited growth of both MV4-11 (acute biphenotypic leukemia) cells and MOLM13 (acute monocytic leukemia) cells approximately 25%, combination treatment of AZD6244 (ARRY-142886) a novel inhibitor of MEK1/2 kinases with sunitinib effectively inhibited proliferation of leukemic cells by approximately 75%. Next, we analyzed apoptotic power and effect of sunitinib n leukemic cells by two different methods and observed similar apoptosis rates. We detected that while caspase-3 activity assay exhibited 21.3% apoptotic induction, cell death assay showed 20.06% increase. As for these results, we detected that sunitinib decreased cell proliferation in a time- and dose-dependent manner, but it had moderate impact on leukemic cell apoptosis compared to untreated control cells. Differing apoptosis rates was reported due to sunitinib treatment in literature. Similar results with us were obtained again in Nishioka et al. s study. They reported that either AZD6244 or sunitinib (10 nM, 48 h incubation) alone resulted in 15% and 42% of apoptosis induction in MV4-11 cells whereas combination treatment increased apoptosis rates to 53%. As for MOLM13 cells, while sunitinib induced 25% of apoptosis, both compounds triggered 49% of apoptosis in leukemic cells. Teng et al. have also reported that sunitinib induced HL-60 leukemic cell apoptosis by 25% in caspase activity measuring tests as similar to our results. Furthermore, in a recent Chinese study, Luo et al. have reported that sunitinib could induce K-562 cells apoptosis in dose- and time-dependent manner and inhibit the growth of K-562 cells efficiently through inducing apoptosis. At the final stage of the study, we analyzed differing transcriptional expression profiles of customly designed regulatory genes before and after sunitinib treatment. Initially, we focused on the genes found in angiogenic pathway responsible for VEGF signaling and detected that VEGFA, VEGFB, VEGFC, as well as FLT1 and KDR expressions were downregulated due to sunitinib treatment, indicating that VEGF signaling was inhibited. Since sunitinib is a potent and selective inhibitor of certain protein tyrosine kinases, including VEGF, many preclinical data have suggested that sunitinib exhibited antitumor activity which might result from both inhibition of angiogenesis and direct antiproliferative effects on various tumor cell types including renal cell carcinoma, breast cancer, and AML.,,,, As for leukemia, in a recently published clinical study, Fiedler et al. reported a phase I/II study of sunitinib inpatients over 60 years of age with AML and activating FLT3 mutations. They observed that, in addition to cytosine arabinoside/daunorubicin induction, sunitinib involvement to therapy for 2 years resulted loss of FLT3 mutations in a group of patients and accelerated therapy. When we checked differing expression profiles of apoptotic genes, we observed that while antiapoptotic BCL2 expression was upregulated, apoptosis inducer genes BAD and BAX expressions were downregulated that were in line with and explain moderate levels of triggered apoptosis results. We also have detected caspase-8 expressional upregulation as similarly indicated in Teng's study and suggested that both the mitochondria and death receptor-induced caspase activation pathways were involved in sunitinib-induced apoptosis obtained from apoptosis assay and gene array results. Next, we analyzed some JAK/STAT pathway members' expressional regulation since the pathway is significantly in correlation with CML pathogenesis also indicated by us, and many other researchers., Among these, critical expressional increases were detected in STAT3 oncogene and STAT5A whereas STAT1 and STAT5B were decreased that led us conclude that sunitinib lacked efficiently blocking the JAK/STAT pathway in leukemic cells with no information about the role cascade and sunitinib in CML. Nevertheless, in a very recent study reported by Watanabe et al., the association between sunitinib-induced stomatitis and STAT3, ABCB1, and ABCG2 polymorphisms in patients with mRCC was evaluated in 52 Japanese patients. They concluded that STAT3 rs744166 polymorphism might be a novel risk factor for sunitinib-induced stomatitis in patients with mRCC. In addition, Xin et al. have reported that STAT3 inhibition by sunitinib-induced mRCC tumor cell apoptosis and reduced immunosuppressive cells. Besides, Yang et al. reported that sunitinib inhibited the migration of pediatric medulloblastoma tumor cells in vitro with induced apoptosis and growth arrest of medulloblastoma cells by inhibiting STAT3 and AKT signaling pathways, indicating a potential use of sunitinib for the treatment. In another study, Anglesio et al. reported that IL6-STAT3-HIF signaling was overexpressed, but therapeutic response was gained due to angiogenesis inhibitor sunitinib in ovarian clear cell cancer. These all reported data give rise the significance of STAT3 in various types of cancers including leukemia as determined in our study, whereas expressional analysis of STAT family members due to sunitinib treatment still seems to be unique for leukemia in literature. As for cell cycle regulatory genes, we detected dysregulated results as for decreases in CDK inhibitors and increases in CDKs working as tumor suppressors and oncogenic activators, respectively. Only CDK2B was upregulated due to sunitinib treatment, and we concluded that cell cycle arrest was not also achieved in CML cells. In mammalian cells, a group of the G1 to S phase transition proteins such as D-type cyclins, CDK inhibitors, and Rb family proteins initiate cell cycle progression; thus, CDKs/cyclins are most likely linked actors in cell cycle regulation, especially in G1 length. The work reported by Yang et al. demonstrated that treatment of sunitinib in medulloblastoma tumor cells resulted in induced cell growth arrest via downregulation of cyclins and upregulation of p21Cip1. However, we did not find such association in our sunitinib-treated CML cells with no proof of G0/G1 phase arrest in the cell cycle. At the final part, we evaluated tumor suppressors' and oncogenes' expressions and detected that NF1, RUNX3, and SMAD4 transcriptional expressions were overexpressed whereas NRAS, PIK3CA, JUNB, and JUND oncogenes were decreased. These were the promising data of the study as pointing sunitinib might be used as a novel agent with combination therapies like reported studies by Nishioka et al.,, They added that sunitinib might be useful for treatment of individuals with leukemia possessing activation mutation of tyrosine kinase, and the combination of sunitinib and rapamycin analog RAD001 represented a promising novel treatment strategy. They also reported that sunitinib induced monocytic differentiation of acute myelogenous leukemia cells, which is enhanced by combination of 1,25-dihydroxyvitamin D3. We detected that sunitinib decreased cell proliferation in a time- and dose-dependent manner and sunitinib had moderate impact on leukemic cells compared to untreated control cells. Overall, our study supports that sunitinib might be used as a novel therapeutic target as combination therapies to trigger apoptosis in CML cells which in turn might accelerate therapeutic response in regard to inhibiting oncogenes and enhancing tumor suppressors in cooperation with cell cycle regulatory genes. Ege University Research Projects Board, 2013-TIP/014. Rowley JD. Letter: A new consistent chromosomal abnormality in chronic myelogenous leukaemia identified by quinacrine fluorescence and Giemsa staining. Nature 1973;243:290-3. Gora-Tybor J, Robak T. Targeted drugs in chronic myeloid leukemia. Curr Med Chem 2008;15:3036-51. Manley PW, Cowan-Jacob SW, Mestan J. Advances in the structural biology, design and clinical development of BCR-ABL kinase inhibitors for the treatment of chronic myeloid leukaemia. Biochim Biophys Acta 2005;1754:3-13. Ferrara N. Role of vascular endothelial growth factor in physiologic and pathologic angiogenesis: Therapeutic implications. Semin Oncol 2002;29:10-4. Liu P, Li J, Han ZC, Lu H, Wang Y, Xu B, et al. Elevated plasma levels of vascular endothelial growth factor is associated with marked splenomegaly in chronic myeloid leukemia. Leuk Lymphoma 2005;46:1761-4. Chen H, Shen YF, Gong F, Yang GH, Jiang YQ, Zhang R. Expression of VEGF and its effect on cell proliferation in patients with chronic myeloid leukemia. Eur Rev Med Pharmacol Sci 2015;19:3569-73. Chow LQ, Eckhardt SG. Sunitinib: From rational design to clinical efficacy. J Clin Oncol 2007;25:884-96. Ansari Z, George MK. Drug-induced immune-mediated thrombocytopenia secondary to sunitinib in a patient with metastatic renal cell carcinoma: A case report. J Med Case Rep 2013;7:54. Sun L, Liang C, Shirazian S, Zhou Y, Miller T, Cui J, et al. Discovery of 5-[5-fluoro-2-oxo-1,2- dihydroindol-(3Z)-ylidenemethyl]-2,4- dimethyl-1H-pyrrole-3-carboxylic acid (2-diethylaminoethyl) amide, a novel tyrosine kinase inhibitor targeting vascular endothelial and platelet-derived growth factor receptor tyrosine kinase. J Med Chem 2003;46:1116-9. Hayakawa F, Towatari M, Kiyoi H, Tanimoto M, Kitamura T, Saito H, et al. Tandem-duplicated flt3 constitutively activates STAT5 and MAP kinase and introduces autonomous cell growth in IL-3-dependent cell lines. Oncogene 2000;19:624-31. Mizuki M, Fenski R, Halfter H, Matsumura I, Schmidt R, Müller C, et al. Flt3 mutations from patients with acute myeloid leukemia induce transformation of 32D cells mediated by the ras and STAT5 pathways. Blood 2000;96:3907-14. Ikezoe T, Nishioka C, Tasaka T, Yang Y, Komatsu N, Togitani K, et al. The antitumor effects of sunitinib (formerly SU11248) against a variety of human hematologic malignancies: Enhancement of growth inhibition via inhibition of mammalian target of rapamycin signaling. Mol Cancer Ther 2006;5:2522-30. Teng CL, Yu CT, Hwang WL, Tsai JR, Liu HC, Hwang GY, et al. Effector mechanisms of sunitinib-induced G1 cell cycle arrest, differentiation, and apoptosis in human acute myeloid leukaemia HL60 and KG-1 cells. Ann Hematol 2013;92:301-13. Nishioka C, Ikezoe T, Yang J, Takeshita A, Taniguchi A, Komatsu N, et al. Blockade of MEK/ERK signaling enhances sunitinib-induced growth inhibition and apoptosis of leukemia cells possessing activating mutations of the FLT3 gene. Leuk Res 2008;32:865-72. Luo LQ, Cheng X, Chen Y, Cui ZL, Lin DH. Effect of SU11248 on leukemia cell line K562 and its molecular mechanisms. Zhongguo Shi Yan Xue Ye Xue Za Zhi 2014;22:965-70. O'Farrell AM, Abrams TJ, Yuen HA, Ngai TJ, Louie SG, Yee KW, et al. SU11248 is a novel FLT3 tyrosine kinase inhibitor with potent activity in vitro and in vivo. Blood 2003;101:3597-605. O'Farrell AM, Foran JM, Fiedler W, Serve H, Paquette RL, Cooper MA, et al. An innovative phase I clinical study demonstrates inhibition of FLT3 phosphorylation by SU11248 in acute myeloid leukemia patients. Clin Cancer Res 2003;9:5465-76. Schueneman AJ, Himmelfarb E, Geng L, Tan J, Donnelly E, Mendel D, et al. SU11248 maintenance therapy prevents tumor regrowth after fractionated irradiation of murine tumor models. Cancer Res 2003;63:4009-16. Abrams TJ, Murray LJ, Pesenti E, Holway VW, Colombo T, Lee LB, et al. Preclinical evaluation of the tyrosine kinase inhibitor SU11248 as a single agent and in combination with “standard of care” therapeutic agents for the treatment of breast cancer. Mol Cancer Ther 2003;2:1011-21. Mendel DB, Laird AD, Xin X, Louie SG, Christensen JG, Li G, et al. In vivo antitumor activity of SU11248, a novel tyrosine kinase inhibitor targeting vascular endothelial growth factor and platelet-derived growth factor receptors: Determination of a pharmacokinetic/pharmacodynamic relationship. Clin Cancer Res 2003;9:327-37. Fiedler W, Kayser S, Kebenko M, Janning M, Krauter J, Schittenhelm M, et al. A phase I/II study of sunitinib and intensive chemotherapy in patients over 60 years of age with acute myeloid leukaemia and activating FLT3 mutations. Br J Haematol 2015;169:694-700. Dalgıç CT, Kaymaz BT, Özkan MC, Dalmızrak A, Şahin F, Saydam G. Investigating the role of JAK/STAT pathway on dasatinib-induced apoptosis for CML cell model K562. Clin Lymphoma Myeloma Leuk 2015;15:S161-6. Kaymaz BT, Selvi N, Gündüz C, Aktan C, Dalmızrak A, Saydam G, et al. Repression of STAT3, STAT5A, and STAT5B expressions in chronic myelogenous leukemia cell line K-562 with unmodified or chemically modified siRNAs and induction of apoptosis. Ann Hematol 2013;92:151-62. Steelman LS, Pohnert SC, Shelton JG, Franklin RA, Bertrand FE, McCubrey JA. JAK/STAT, raf/MEK/ERK, PI3K/Akt and BCR-ABL in cell cycle progression and leukemogenesis. Leukemia 2004;18:189-218. Mata R, Subirá D, García-Raso A, Llamas P. JAK2 as a molecular marker in myeloproliferative diseases. Cardiovasc Hematol Agents Med Chem 2007;5:198-203. Watanabe A, Yamamoto K, Ioroi T, Hirata S, Harada K, Miyake H, et al. Association of single nucleotide polymorphisms in STAT3, ABCB1, and ABCG2 with stomatitis in patients with metastatic renal cell carcinoma treated with sunitinib: A retrospective analysis in Japanese patients. Biol Pharm Bull 2017;40:458-64. Xin H, Zhang C, Herrmann A, Du Y, Figlin R, Yu H. Sunitinib inhibition of stat3 induces renal cell carcinoma tumor cell apoptosis and reduces immunosuppressive cells. Cancer Res 2009;69:2506-13. Yang F, Jove V, Xin H, Hedvat M, Van Meter TE, Yu H. Sunitinib induces apoptosis and growth arrest of medulloblastoma tumor cells by inhibiting STAT3 and AKT signaling pathways. Mol Cancer Res 2010;8:35-45. Anglesio MS, George J, Kulbe H, Friedlander M, Rischin D, Lemech C, et al. IL6-STAT3-HIF signaling and therapeutic response to the angiogenesis inhibitor sunitinib in ovarian clear cell cancer. Clin Cancer Res 2011;17:2538-48. Lange C, Calegari F. Cdks and cyclins link G1 length and differentiation of embryonic, neural and hematopoietic stem cells. Cell Cycle 2010;9:1893-900. Nishioka C, Ikezoe T, Yang J, Yokoyama A. Sunitinib, an orally available receptor tyrosine kinase inhibitor, induces monocytic differentiation of acute myelogenous leukemia cells that is enhanced by 1,25-dihydroxyvitamin D(3). Leukemia 2009;23:2171-3.